There was a time when skiing glades – pockets of trees between trails – was forbidden. In the 80’s, ropes went up alongside every trail to keep you out of the stashes of snow between the groomed and bumped boulevards. Trail maps and tickets had disclaimers that skiing off trail would result in the loss of ski privileges. Like everything, skiing is cyclical. The era of restricting skiers to trails has been replaced at some ski areas by a dropping of the ropes and a boundary-to-boundary “ski wherever you like” philosophy. 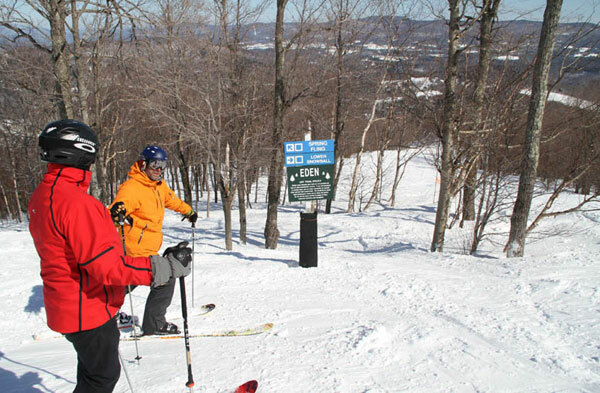 Several New England resorts including Jay Peak, Smugglers’ Notch, Sugarbush, Sugarloaf, Saddleback, and Bretton Woods have cut significant glades and now mark them on their trail maps. Out west, some of the best glade skiing is at Heavenly, Wolf Creek, Steamboat and The Monashees in Canada. Glades skiing is a unique treat – off the beaten groomed path, you can often find preserved powder days after a storm, not to mention glades are beautiful. Birch and pine trees stand among sparkling snow, with rays of sunlight streaming in. 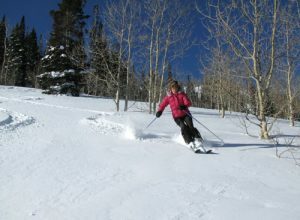 Kids love glades for the ups, downs and around, skiing the trees is fun and dynamic. Glades are good for your skills too, as you must turn and react to the ever-changing terrain. And glades are not necessarily more dangerous than groomed open trails as long as you adhere to a few glade safety rules. Ski more slowly in the glades. Natural obstacles exists, including the obvious trees, tree roots, stumps, rocks, and low hanging limbs. You need to be prepared for anything Mother Nature has in store overhead, and under a shallow dusting of snow. Use the buddy system, don’t ski glades along. Ski in groups of three or more, and keep a safe but in sight distance with your fellow skiers or riders, ideally several turns apart. An occasional hoot helps you group know you are safe and having fun. Pick your path prudently, and ideally follow tracks if it’s your first time on that glade trail. You don’t want to end up in a gulley or a river bed. No tracks could mean no good, or no easy way out (read: hiking in ski boots). Focus on the space between the trees, not the trees themselves. Look where you want to go, not where you fear you might end up. Beware of tree wells, the ground surrounding a tree has softer, warmer snow pockets that you can easily get trapped in. Give trees their space, don’t ski too closely to the tree base. Kids love glades for their adventurous nature. Just caution them to slow down and use their head – well, not literally. Helmets are a good idea in glades. to be lost on the mountains in the woods. Try a glade, with a friend. It’s like skiing before chainsaws, groomers and snowmaking. Glade skiing is good, and good for the earth too.